Below are a couple of watches that have passed through my collection or across my workbench. I present them here because of some special feature, brand, or oddity that makes them noteworthy. This is not be any means the extent of my collection, only those few that have received the grace to be listed here. I recently picked up an "Andre Bouchard" signed watch in an auction lot. Upon opening the case I was surprised to discover that it utilized a Standard Time movement. The Standard Time Corporation, located in the U.S. Virgin Islands, was owned by the Hamilton Watch Company. Standard Time made movements for Hamilton's Vantage line of watches in the 1960s. These movements were shipped to Pennsylvania where the Vantage watches were then assembled. With this discovery it seems that Hamilton Standard Time (ST) movements were used in watches under different labels such as "Andre Bouchard". I have since seen several other watches that contain ST movements. It would seem that Hamilton supplied these movements to brands other than their own. For example I have a Buren alarm watch that uses a Standard Time Movement. "Andre Bouchard" is the store brand of the once famous E.J. Korvette department store. Korvette's, as it was also known, was founded in New York City in 1948 and became a large discount department store chain in the U.S. east coast and mid west. They were among the first stores to successfully dispute state and local Sunday-closing laws. They are also known to history as being among the first department stores to challenge suggested retail price provisions of anti-discounting statutes. In other words, Korvette's defied "fair trade agreements" whereby suppliers or manufacturers set retail prices to which their retailers were legally bound. It is because of this reputation for defiance that I found it doubly curious that Hamilton made movements were put inside Korvette watches. According to Don Sauers in his book "Time for America: Hamilton Watch 1892-1992," Hamilton obtained in July 1955 "a temporary injunction restraining E.J. Korvette of New York from advertising or selling Hamilton products at less than fair trade prices, pending a hearing" (p. 198). A Federal judge decided in favor of Hamilton. Although they won the battle, they lost the war. Sauers relates that on January 26, 1962, Hamilton ceased all fair trade agreements for their watches in the face of changing legal and economic opinion. I guess Hamilton decided that you if can't beat them, then join them - by supplying Korvette's not with Hamilton branded watches for sale at an embarrassing low discount, but with discounted Hamilton ST movements that Korvette's could put in their Andre Bouchard branded watches. An interesting economic turn of events, don't you think? This watch carries a vintage stainless steel band that is not original, but fits the feel of the watch quite well. This is a real treasure. This watch has survived the Great Depression and World War II. It is a highly collectible Bulova Lone Eagle style watch from 1927/1928. The Crystal is a glass crystal not a replacement plastic one with only a very slight barely noticeable scratch near the 8 o'clock mark. The movement dust cover is still intact in the hinged back chrome case that is in excellent condition. It is running, but could use a little attention to make it great again. This style watch is one of my favorites. I feel that it epitomizes everything that a classic watch should. It is simple, yet elegant. It looks like the Lone Ranger's pistol and a piece of jewelry all in one. And to still be running after 90 years is a real feat. The movement is a 15 Jewel Bulova 10AN. It has the square or diamond shaped date mark on the movement making it a 1927 model. The case however appears to be closer to a 1928 Templar Style. As is common with many older watches, the cases would get damaged and the movements moved to a newer case, or the movement would be beyond repair and switched out for a spare. I don't know the story on this watch, but most people would recognize it as a Bulova Lone Eagle Style since this is more in line of the Lone Eagle Watches from the 1930's. It is an exceptional piece and deserves the care of a true collector. The band is not original, but is a nice Leather Alligator skin band. Watches made before the 1940/50's usually have a Sub-second dial like we are used to seeing on a pocketwatch. There are a few examples of early innovation with the center second hand. These are traditionally referred to as "Doctor's" or "Nurse's" watches as they were used by Medical personnel to check the pulse of a patient. This is a very unique example since it is about a decade before most Bulova center second hand watches hit the market. ​The second hand is not correct and will be replaced with a period correct one. The watch is currently running and is a treasured piece of my collection. This is the newest addition to my personal collection. It is a 15 jewel Omega with an auxiliary center sweep second hand. This was just at the point where center second hands were becoming the preference. This watch has an understated simplicity with it's bright dial and painted / gold leaf markers. This is watchmaking at it's finest. This is a really great watch. The 1927 Bulova Lone Eagle was made to commemorate Charles Lindbergh flight across the Atlantic. Originally it was more square with cut corners. After a while the styling was changed into what you see here. It was wildly successful and one of the most copied watches of the time. The Winton on this page is a knock off of the style. The movement is a square date code 10AN, which dates to 1927, but the case appears to be a later design. I believe this is a 1927 movement in a later case. This often happened if the case was scratched or damaged. It is currently running but is in need of cleaning. It still has the dust cover. The hinged case and crystal are in excellent condition. The crystal has no scratches. 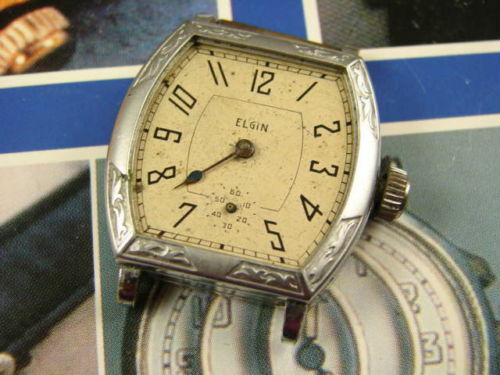 The dial has a perfect patina, and is an unusual one most likely from the late 1920's. The hands are in functional condition, but the hour hand needs a little attention, and they could use a relume. This is my "daily driver" in it's as found condition. . It is most likely from the late 20's but difficult to accurately date without further research. The style is very close to the Bulova Lone Eagle. Winton watches were one of the names imported by the Didisheim family. The Didisheims went on to create Marvin Watches. A brand that is still in operation today. The history of their company dates back to the 1800's. They were based in New York City. "Taking advantage of the openings offered by the booming American market hungry for watches of Swiss quality, Hyppolite established a subsidiary in the USA – Hipp. Didisheim co. – which imported the brands Winton, Nassau and lancet." Westfield was a division of Bulova watches. They offered watches that were almost identical to the Bulova equivalents with minor functional differences to reduce the cost. Some of these differences included the dial design and the jewel count. The fascinating thing is that this watch has a shockproof system that wasn't used on the mainline Bulova's until decades later. This is a stunning vintage Westfield. The watch is most likely from the late 1920s or 1930s. The case is a really cool vintage hinged case that holds a 7M Westfield / Bulova movement with an Omega Symbol. It looks a lot like the lone eagle from that time. The watch comes with a Kreisler Lizard Skin replacement band (Not pictured, the one in the picture is a generic leather band) as well as the original decorative "Ladder style" metal band and original clam shell case. The crystal is beautiful and real glass (many times these were broken and replaced). The watch is running and keeping excellent time. A valuable addition to any collection. *The green box is decorative and not included. This is a truly unique piece. It is the first windowed calendar watch made by Bulova, and the first by any american watchmaker. There was one previously made by “Champ” for Bulova in the 1930s, but this appears to be the first factory calendar watch. The watch is in remarkable condition. It is currently running and keeping excellent time (the date wheel has been adjusted, I need to get a new picture). The movement is a 21 Jewel Bulova 10CBCD which is probably a variation of the Bulova 10BCC (surgeons watch). With an added date complication. I think this watch was designed to be an automatic...at least in the planning stage. There are nearly Identical watches without the date windows that have the same bubble back in automatic. At the time Rolex was a most feared competitor, perhaps the Automatic piece was not included because it would be too close the the Rolex version. We may never know. Perhaps one day I will find a prototype automatic and calendar model from this year. Bulova did not have that combination until the 1960's. ​I have included some pictures of Omega and Rolex models from the same time. Not for nothing there are striking similarities. Purchased not running with a broken crystal. Repair needed: New crystal, Hands and band, New Balance Staff. Cleaned, Oiled, Adjusted. This very early Boy Scouts of America watch was made by US Time Corp. For those that don't know they were Timex before they were Timex. The model of this watch is a Timex which became so popular they renamed the company after it. It shows the BSA logo at the bottom. The watch is currently running but gaining time and in need of Cleaning, Oiling, Adjusting. The ad is from 1956. This watch is beautiful and has a quick set date feature. just press the crown to advance the date. This is a very unique watch from the 50s. It has hand painted script numbers rather than applied gold numbers. The movement is a 10BT stamped "L3". It is in absolutely beautiful condition. Very unique. From a crazy time in watch making. Single Jeweled Manual wind movement. Accurate and running strong. Repair needed: New Crystal, Sub-second Hand, Band, Clean, Oil, Adjusted. Movement is a ESA - A3574 - Stamped with the 1936+ TR in a shield. Granted, Mine doesn’t look quite this nice, but how much would you like to own a piece of history? In 1888, a businessman and entrepreneur by the name of Carl-Friedrich Bucherer and his wife Luise opened Lucerne's first watch and jewelry store and laid the cornerstone for a successful family company. Bucherer partnered with a then little known watchmaker Hans Wilsdorf that was just starting his watch company called ROLEX. The two companies have been inseparable ever since. This is a 1930’s Ladies wrist watch with wire lugs and a replacement band. It is triple signed by Bucherer and the dial is enamel painted.